The granddaughter of naturalist Charles Darwin, Gwen Raverat was one of the first women to insist on and achieve professional training as an artist. She attended the Slade School in 1908, quickly developing her own painterly style of wood-engraving. She was a highly individual and intensely personal artist largely responsible for the revival of wood engraving as an original art form at the beginning of the twentieth century. Her first engravings date from 1909 and by 1920 she was the only female artist to join Eric Gill, Lucien Pissarro, Edward Gordon Craig, Noel Rooke, E. M. O'R. Dickey, Philip Hagreen, Sydney Lee, John Nash, and Robert Gibbings in founding the Society of Wood Engravers. During her early years she became friends with Stanley Spencer, Rupert Brooke, her cousin Ralph Vaughan Williams, André Gide, Paul Valéry, Vanessa and Virginia Stephen (soon to be Bell and Woolf). In 1911 she married French painter, and fellow Slade student, Jacques Raverat and the couple moved to Vence, near Nice, when Jacques was diagnosed with 'disseminated sclerosis' or MS. During this time she maintained an active association with the Bloomsbury Group and produced several of her best known prints. After her husband's death in 1925 Gwen moved back to England and re-invented herself as an art critic, professional wood engraver and book illustrator. In 1929 Gwen designed the ballet 'Job: A Masque for Dancing' for her cousin Vaughan Williams who composed the music and Ninette de Valois who choreographed it. She moved back to Cambridge before the Second World War and drew maps for the Admiralty as her war effort. In 1946 she moved into the Old Granary, now one of the buildings that house Darwin College in Cambridge. In 1952 Faber & Faber published her memoir of her extraordinary childhood, 'Period Piece', which has never been out of print since first publication. She died in 1957, a Cambridge institution. 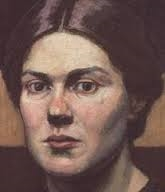 You can see Elisabeth Vellacott's portrait of Gwen Raverat at Kettle's Yard in Cambridge.